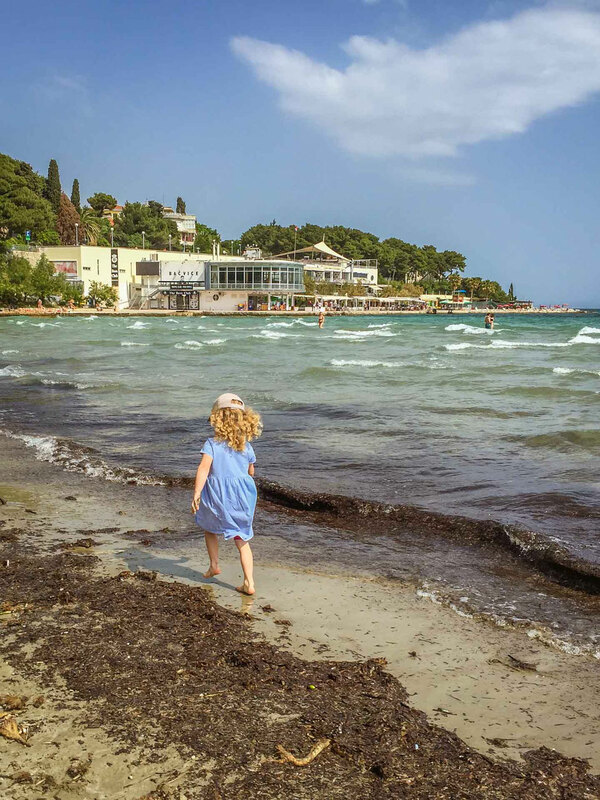 Visiting Croatia with kids? 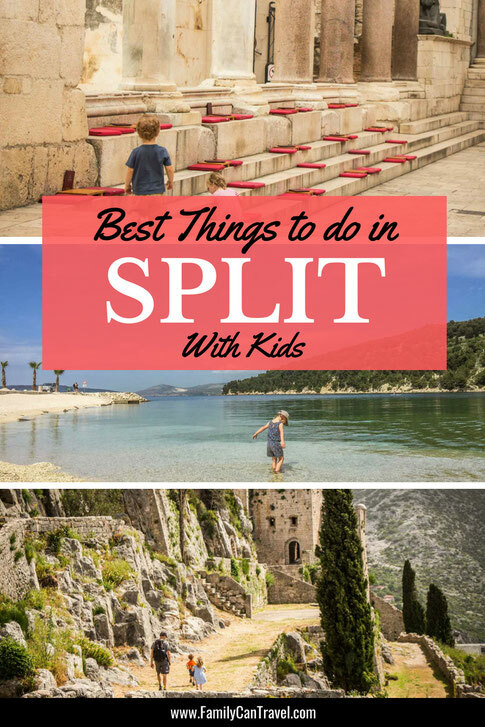 You’ll find plenty of things to do in Split with kids! 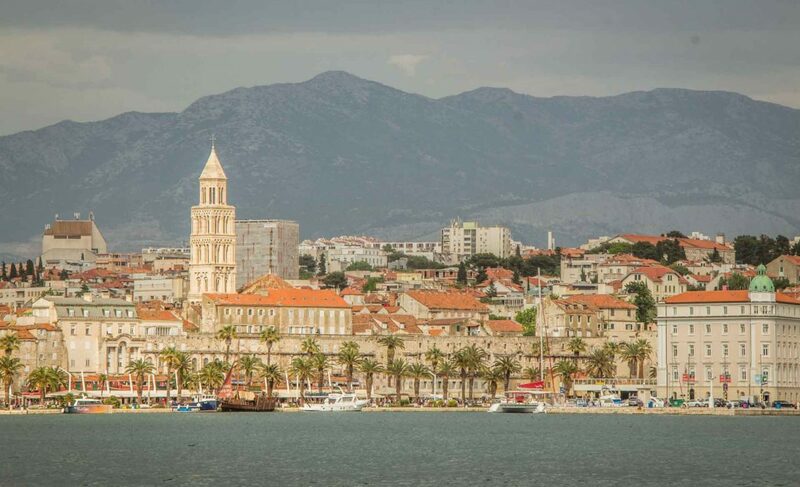 Split is Croatia’s second largest city and is the perfect spot to enjoy some beach time while immersing yourself in some ancient history. 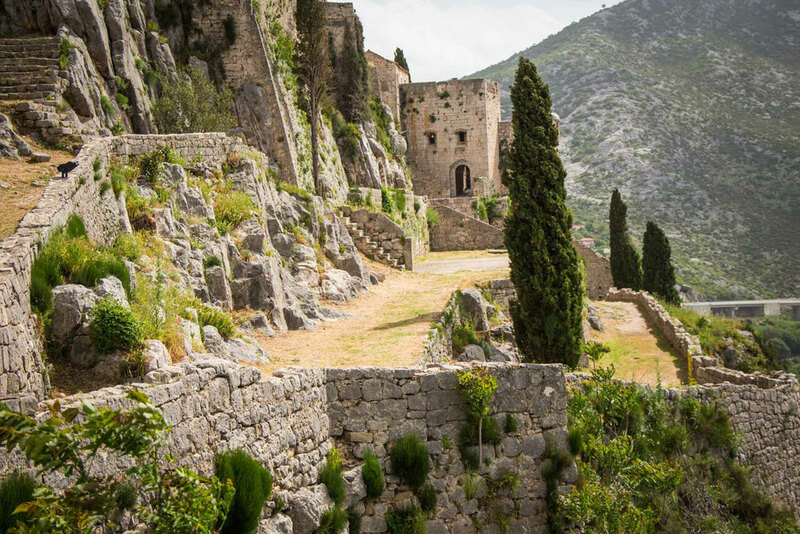 Game of Thrones fans will enjoy the experience of seeing many filming locations, including the fortress used for Meereen. 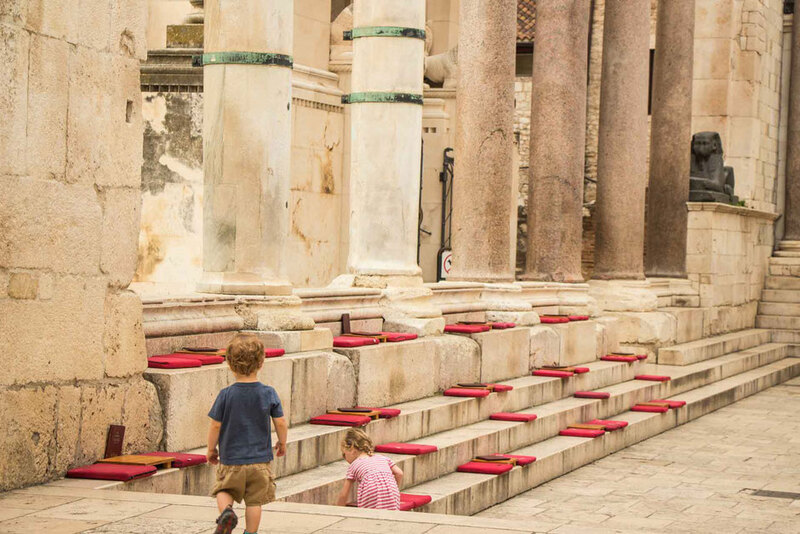 With all of these things being of interest to us, we were excited to spend three days in Split with kids (our kids were 2 & 4 years old at the time). 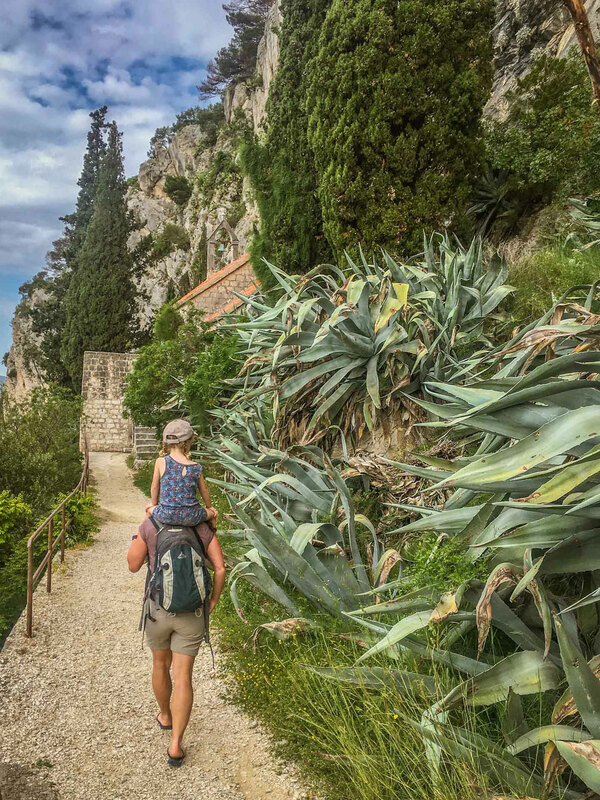 Having arrived late the previous afternoon from the incredible Plitvice Lakes, we were eagerly out the door by 7:30am ready to explore the Old Town. 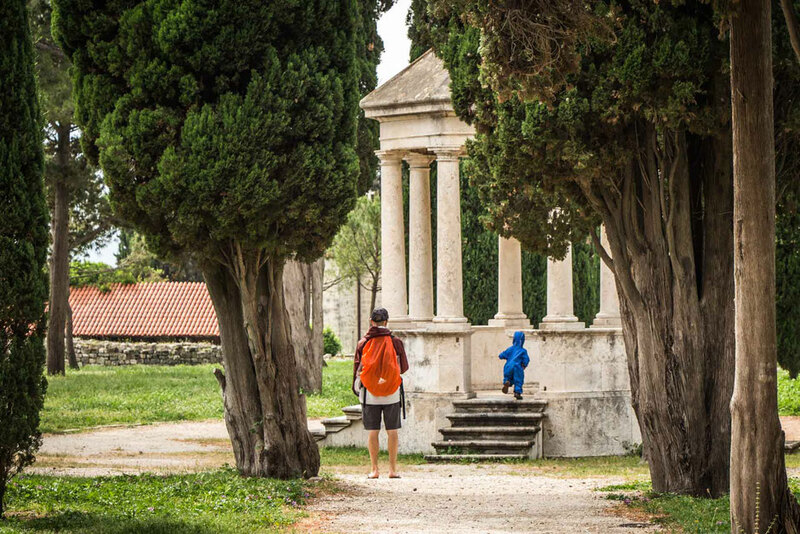 Travelling with small kids who wake up early, we typically have places all to ourselves at this hour of the morning, but in Split we were really surprised by the amount of locals already out and about. It was raining lightly, so we walked to Diocletian’s Palace in an attempt to see the most important parts of Old Town first in case the rain worsened. 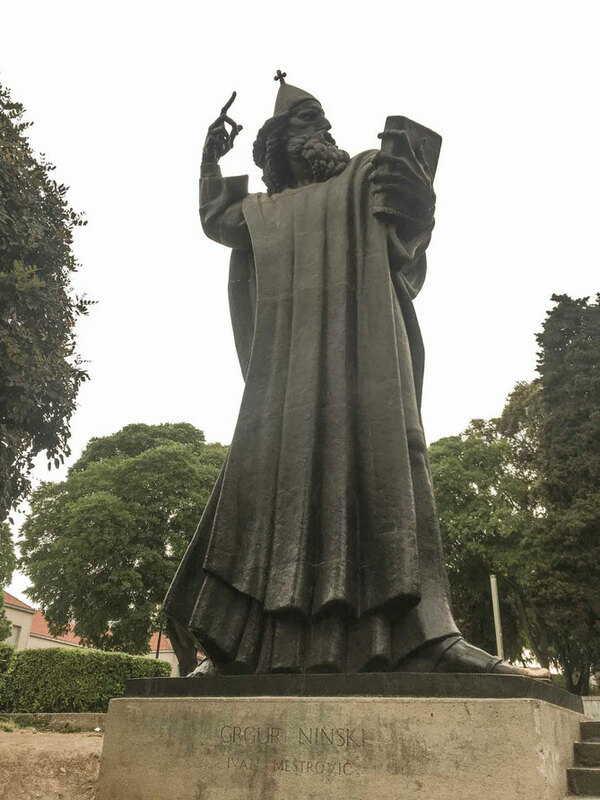 We followed the walking path recommended by our Lonely Planet, starting on the north end of Dioklecjanova by the towering statue of Gregorius of Nin. They say to rub his big toe for good luck. One of our kids did rub his toe and the other refused, so I guess we’ll see if it’s true or not over the next 15 years… haha. 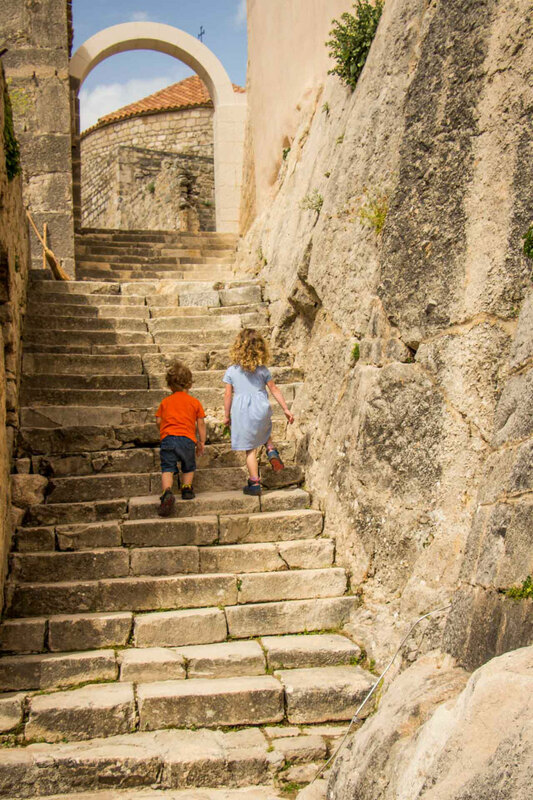 We entered Diocletian’s Palace via the Golden Gate and we followed the kids as they ran into various alleyways, up stairs etc. This is a super fun place for kids to explore, although it’s best to get here early before the huge crowds. Be sure to stay close to them as there are lots of twists and turns and it’s easy to get lost. 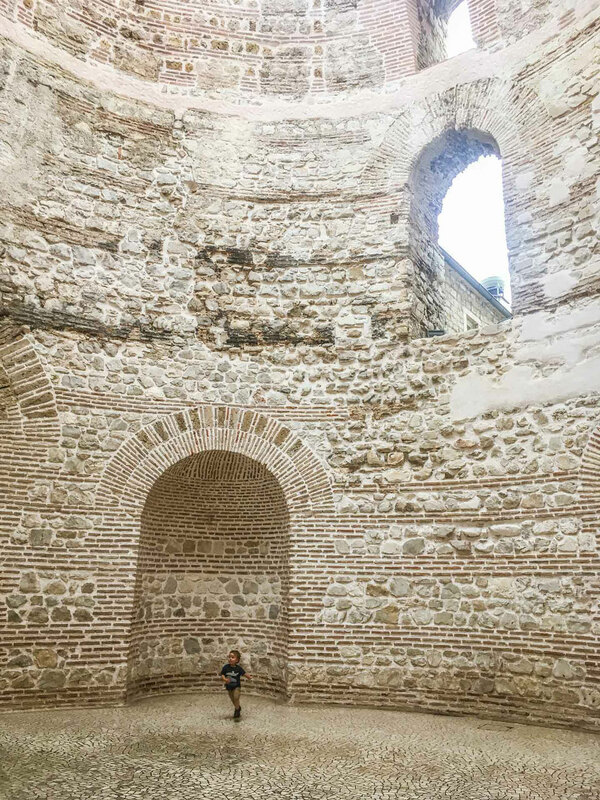 We tried to herd them back to the main artery and eventually we arrived at Peristil, a courtyard nestled between the Temple of Jupiter and the Cathedral of Domnius. We’re both big fans of Egyptian artifacts, so we loved the black sphinx perched up high in this courtyard. At this point, it began to rain quite hard, so we ducked into the Vestibule for cover. The Vestibule is a large room with a domed ceiling with a large hole in the center. The rain cover wasn’t perfect, but it was enough for those of us with the sense to stay out of the rain. The kids, on the other hand, thought it was hilarious to run back and forth under the open dome, getting wetter and wetter as they went. We weren’t properly dressed for the weather, so we needed to get better rain cover, so we paid to enter the Cathedral and the Temple. Both are very small, so it didn’t kill much time. Emerging back into the daylight, the rain had let up a bit, so we hoofed it back to our Airbnb to change into some dry clothes. Travelling with two small kids, we still make sure our 2 year old toddler gets his nap and our daughter gets a little downtime. We also like to keep afternoons a little more low key and often do something we know they will love. So, after his nap we set out on foot towards Jezinac Beach. 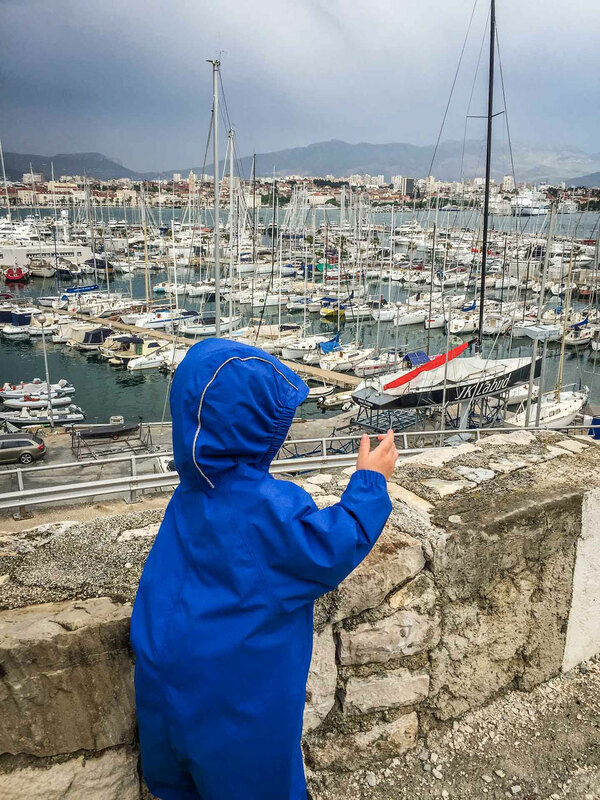 It wasn’t beach weather with the rain (we dressed properly this time), but the kids enjoy Europe’s pebbly beaches and like throwing rocks in the water and looking for pretty rocks. There is a wonderful waterfront promenade that runs along the west side of the harbor which is much less crowded than Riva. The kids loved running along looking at the boats, chasing pigeons etc. We walked through the marina, which added quite a bit of time to the walk (we probably should have gone up to street level and cut the corner). Despite the extra time, the marina walk led us to a charming, yet completely deserted oceanfront park called Sustipan. Leaving this park, we entered another called Zvoncac. 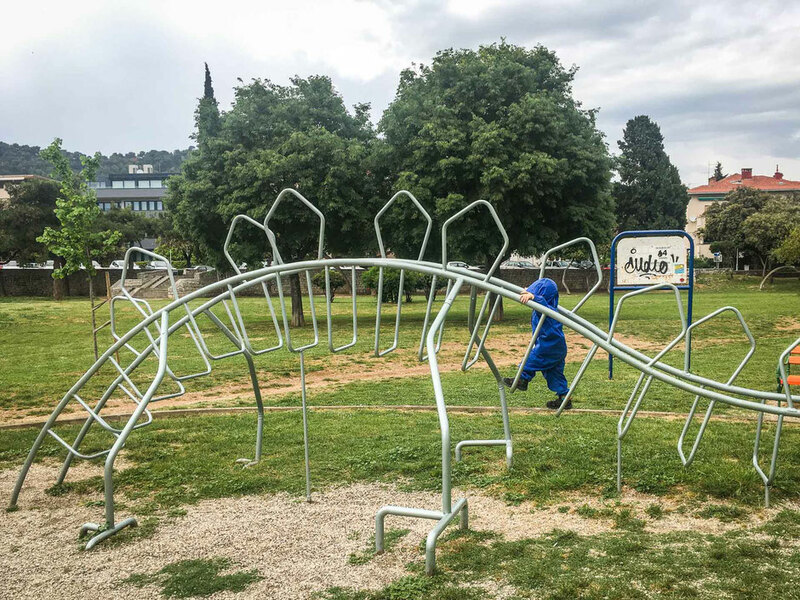 This one had a large dinosaur themed playground, so we let the kids stop play for a while. It was nearing 4pm and because we largely let the kids walk at their own pace (ie: slooooow) we still weren’t at the beach, so we kept on walking along the waterfront. We turned one corner, and then another, and we still weren’t there. We got to the point where we could see the beach about 10 minutes away, but sadly it was time to turn around and go home for dinner. 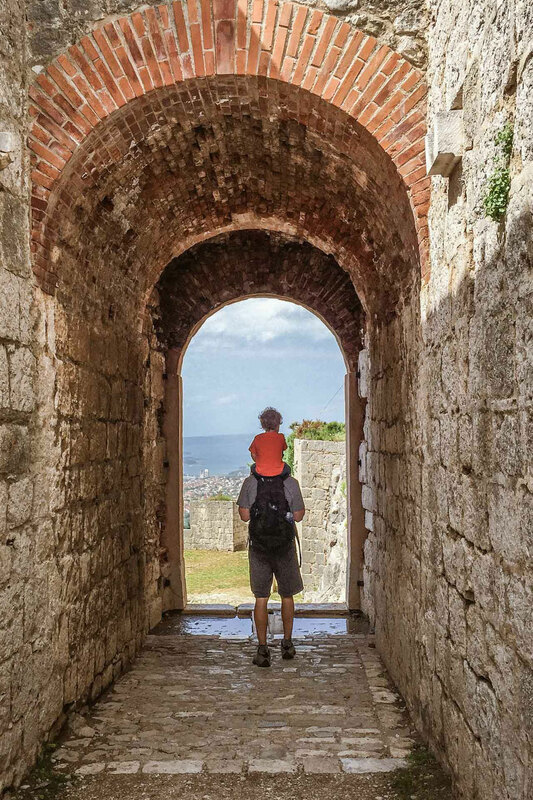 Regardless, it was a wonderful way to spend an afternoon in Split with a toddler and preschooler. The views were definitely worth it. 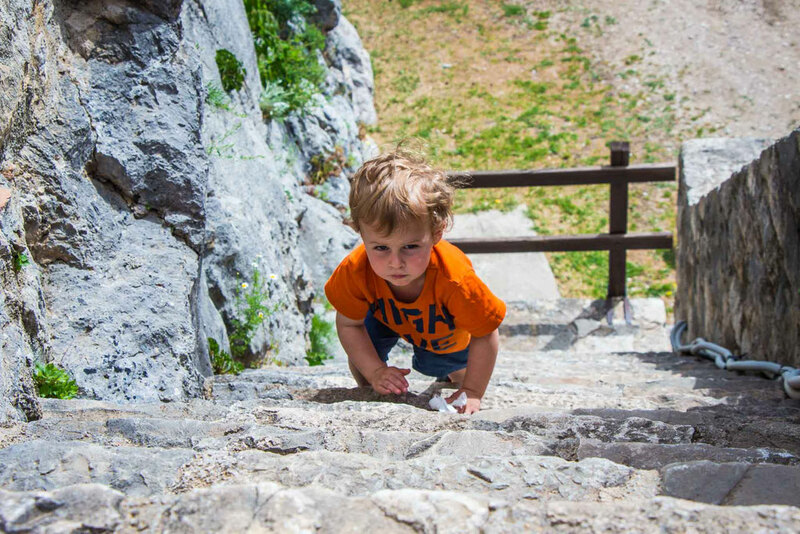 Today we wanted to visit the Klis Fortress, but were having a lot of trouble figuring out how to get there ourselves with the limited information online. We like to travel like the locals and are not big on booking tours, so after an hour or so of research over breakfast, we had a plan in place and headed out the door. After a long wait for our bus (we didn’t know how to read the schedule properly), it was a seamless journey and we arrived at the Klis fortress 45 minutes later. 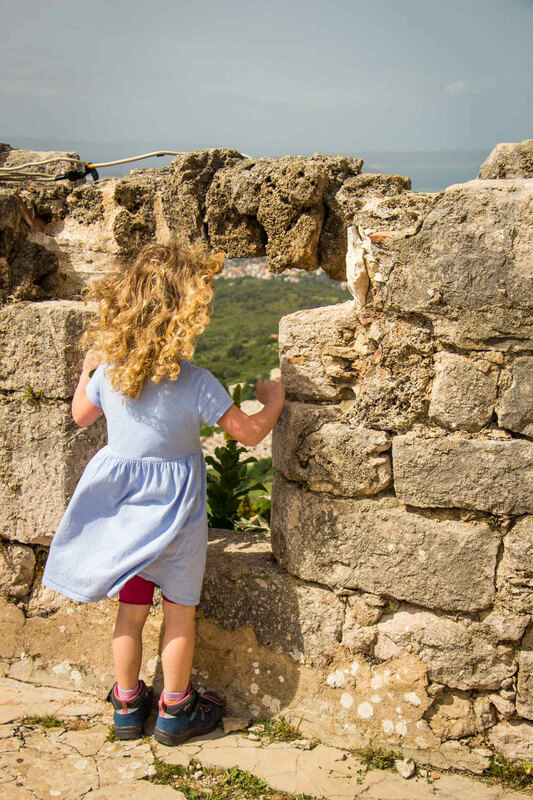 A short walk up a hill got us to the fortress gates and even before you pay to get in, you immediately get to see the sweeping views of the city and Adriatic Sea beyond. This view alone is worth the trip, even without the fortress. 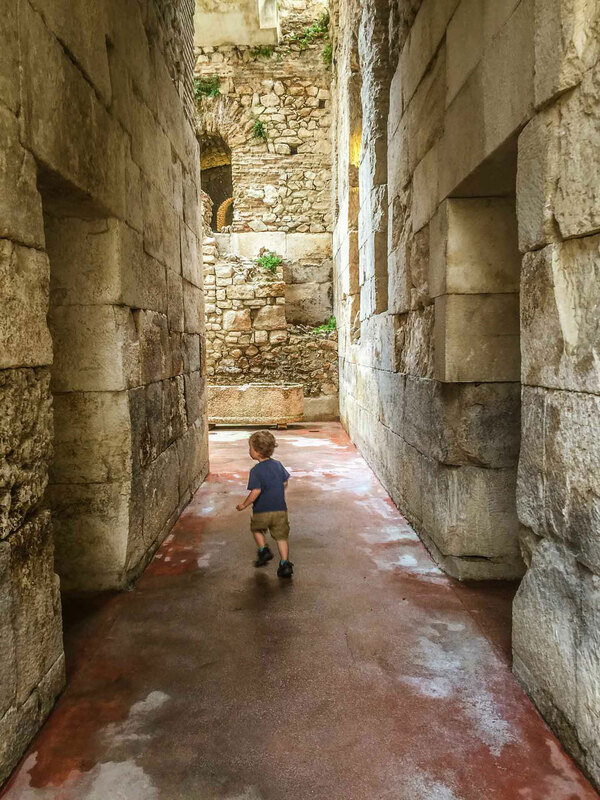 Once you enter, you can wander almost anywhere you want within the fortress. 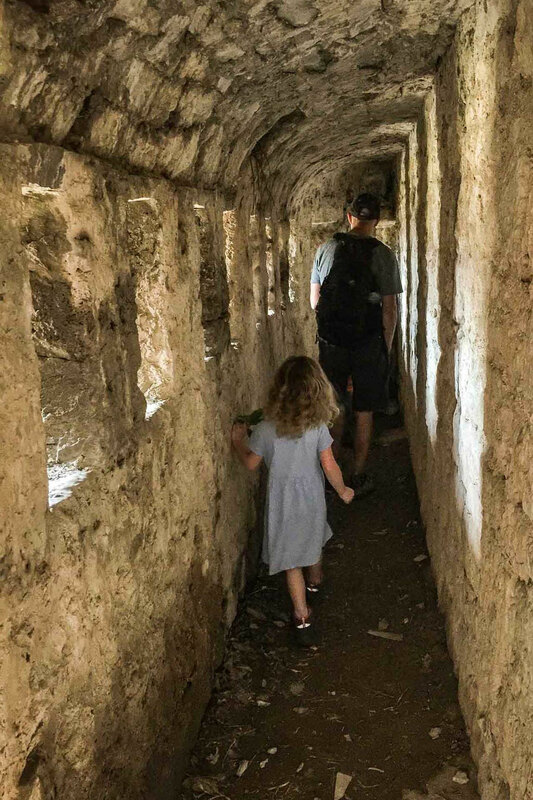 Take your time and enjoy exploring the pathways, tunnels, guard lookouts, etc. Our kids had a ball running around, climbing on stuff, looking out the arrow slits (windows archers used), etc. Watch for a set of tunnels on the far west end of the fortress, which are pretty easy to miss. Your kids will love running through them. Besides the amazing fortress and the views, there is also a small museum within one room, which houses some armor, swords, cannonballs, etc. from hundreds of years ago. 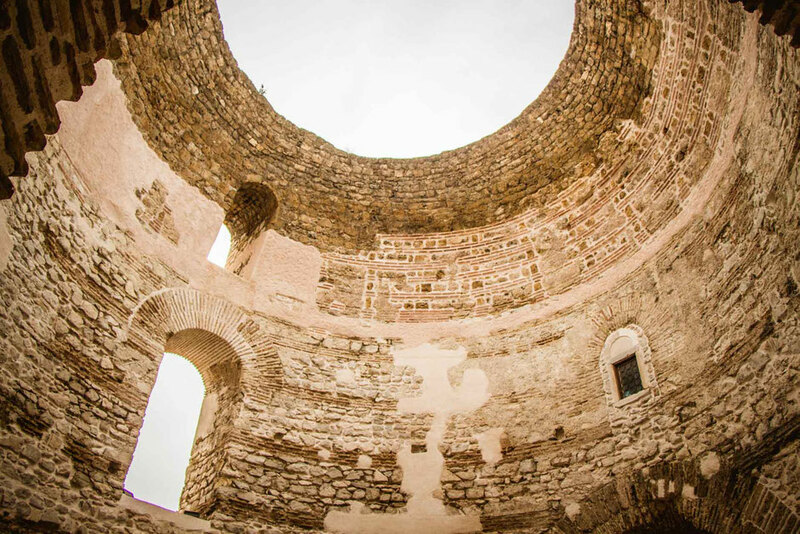 Chances are that if you are visiting the fortress, you are a Game of Thrones fan (like us!) 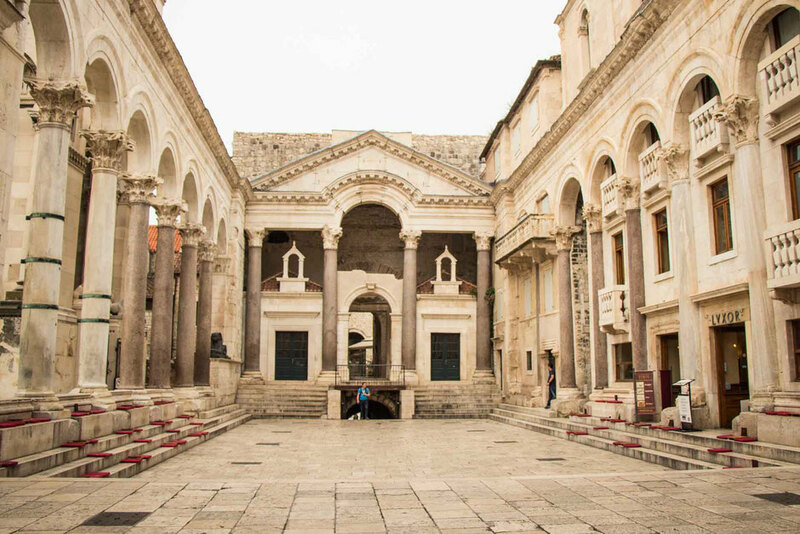 and you know this is fortress is where they film the Meereen scenes. If you are a GOT fan, seek out the room on the east end of the complex which has some photos on the wall. 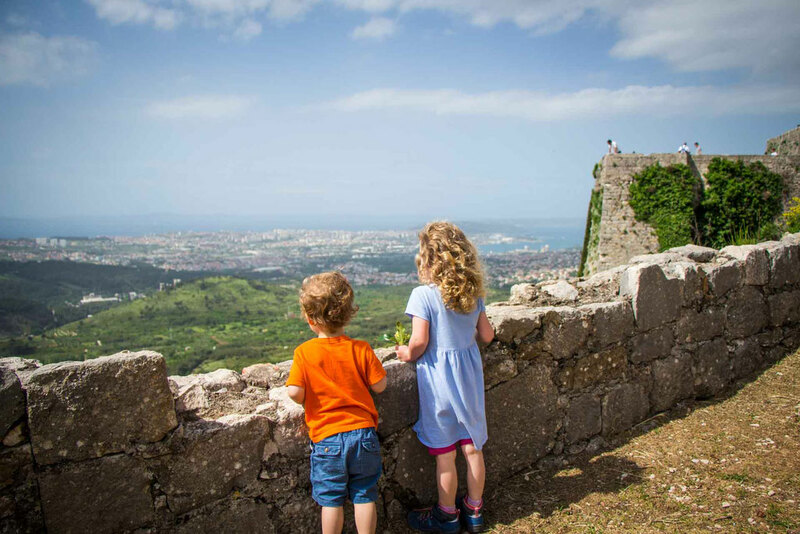 Some of the photos show you the fortress in its natural state, and then the same shot of the fortress as Meereen. We found this comparison really helped us visualize Meereen as we walked through the property, so it’s definitely worth seeking it out. Still not fully understanding the bus schedule, we also had complications on the bus ride home. 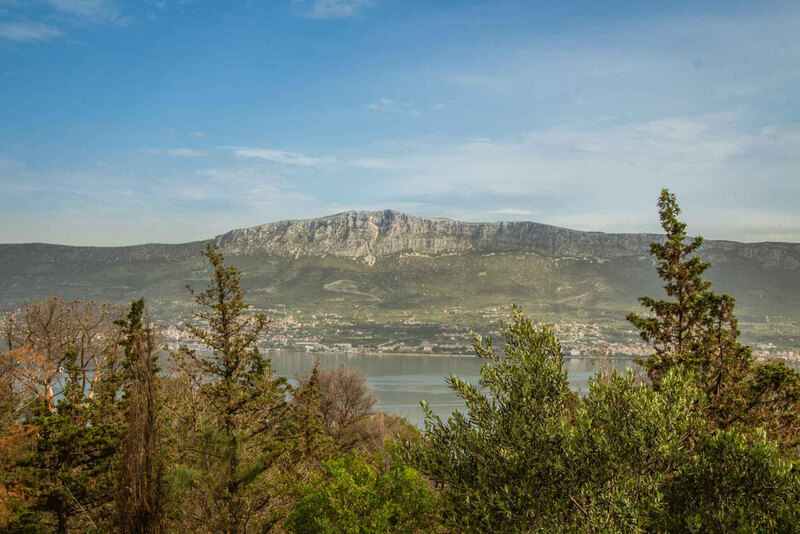 If you wish to take public transit to/from we share all the details in our post on How to Get to Klis Fortress from Split. 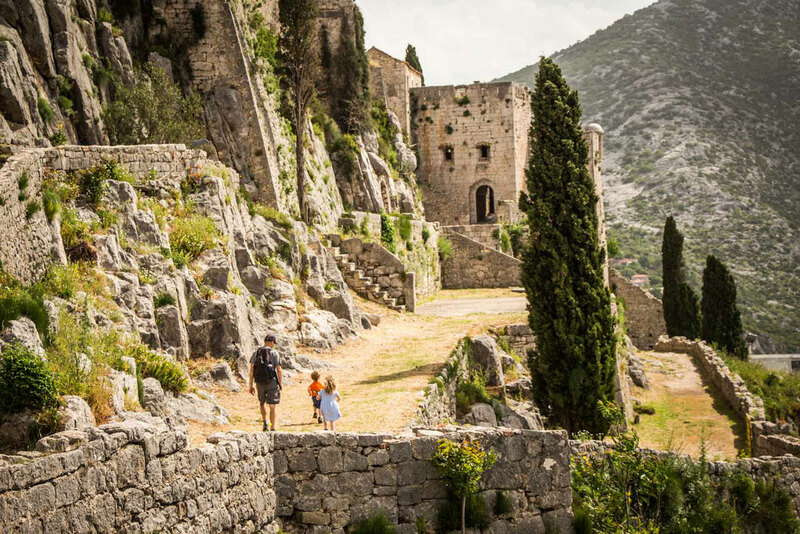 If you’d prefer someone to take you there, join a guided Game of Thrones Tour. 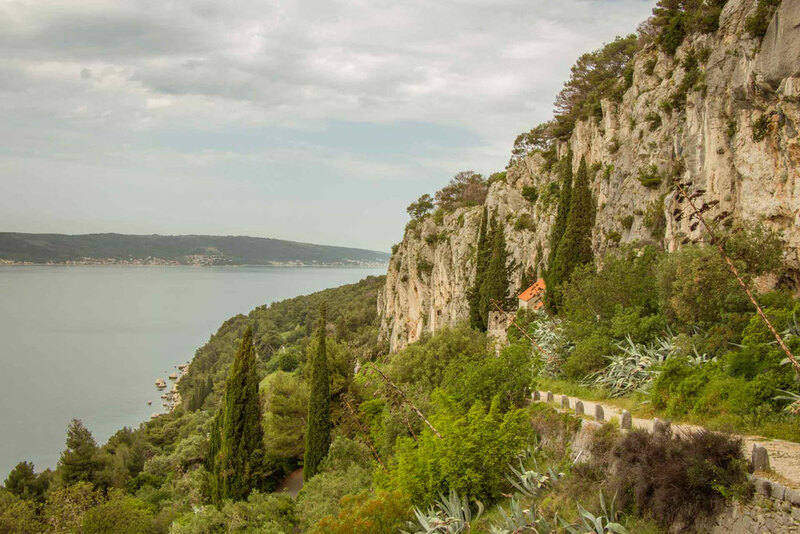 For private transfers around Croatia, you can learn more here. We wanted to check out the in-town beaches as well, so in the afternoon we set out for Bacvice Beach. Learning from yesterday’s experience, we put the kids in their carriers so we could make it there in time for the kids to actually play. We had an enjoyable walk along Riva, then along the ferry docks on our way to the beach. Need a toddler carrier? 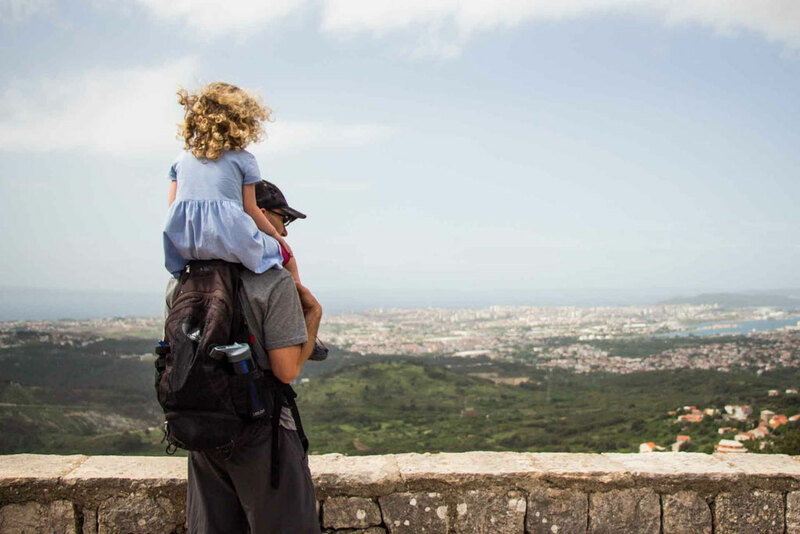 Check out our recommendations best toddler carriers for travel on our Baby Can Travel site! Given it was 83F/28C outside it was no surprise that the beach was very crowded, both in the water and on the sand. It’s a reasonably big beach nestled deep in a cove, so the waves should be pretty small here most of the time. 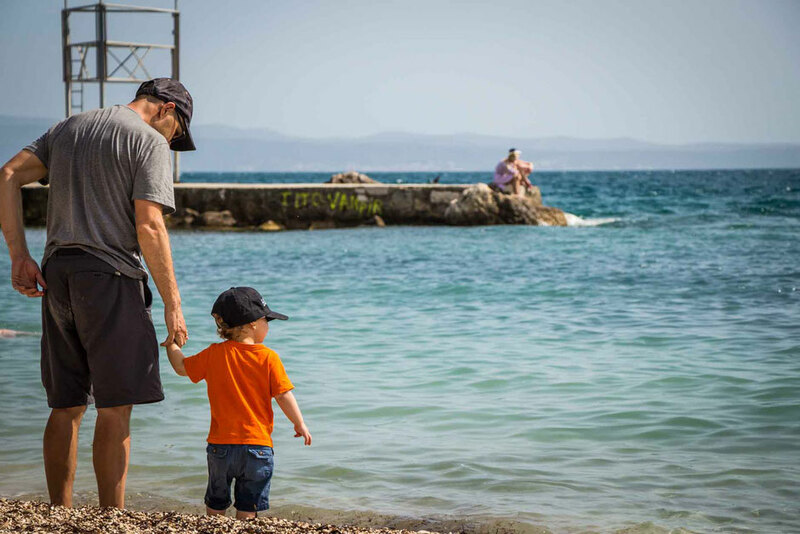 The water is also supposed to be quite shallow, which will also be good for small kids. We were surprised to see real sand on the beach, as every Mediterranean beach we’ve encountered to date has small pebbles on the beach. It’s funny as we promised the kids they could throw rocks into the water, as we were expecting a pebbly beach! We saw on Google Maps that Ovcice Beach was about 0.3mi/0.5km away, so we walked there along a nice oceanfront promenade. Ovcice Beach was much smaller with much less real estate available on the beach. It had way less people there, but it still felt crowded due to its smaller size. The kids were happy that it was a traditional pebble beach as promised, so we found a spot to sit and let the kids do their thing. Our little guy loves to stand in the shallow water and endlessly chuck rocks into the water, giggling the whole time. Our 4 year old daughter likes finding interesting shaped rocks and sea shells. This beach made them both happy. 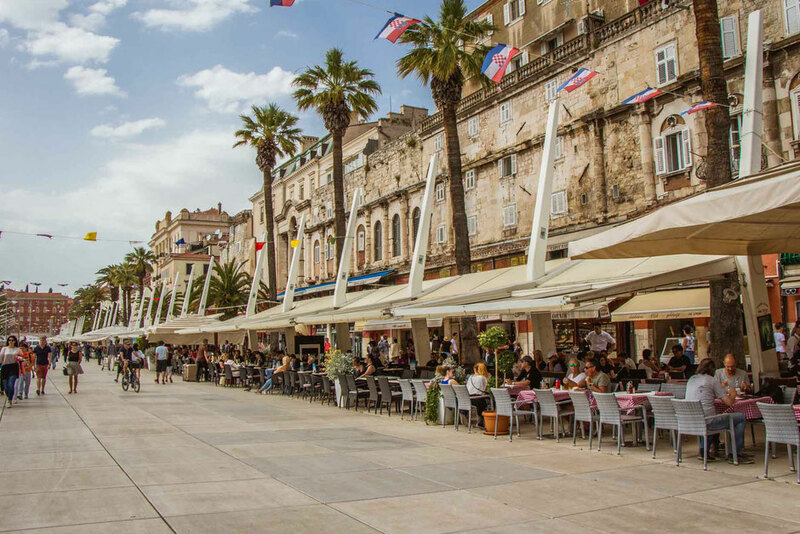 On the way home, we walked through Diocletian’s Palace again and then through the other parts of Old Town in an effort to find some relief from the hot sun and to see streets and alleyways we hadn’t seen the day before. 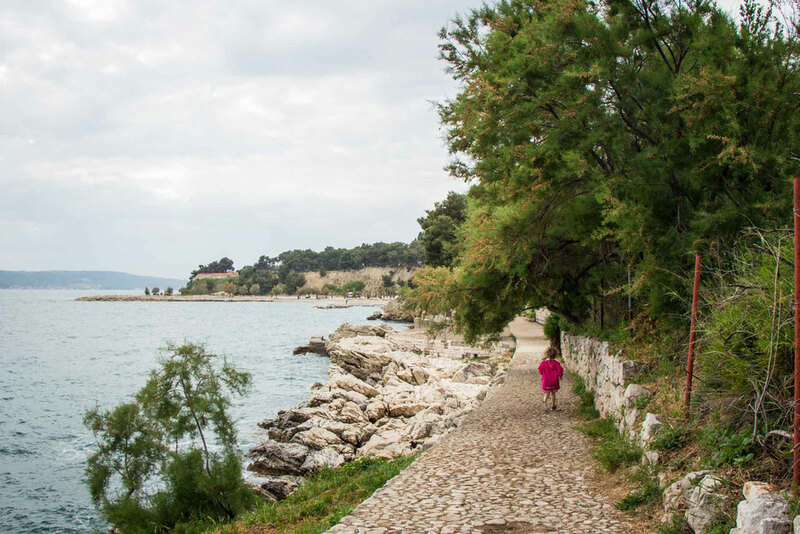 Marjan Park is a huge, beautiful park located just an easy walk from the center of town. 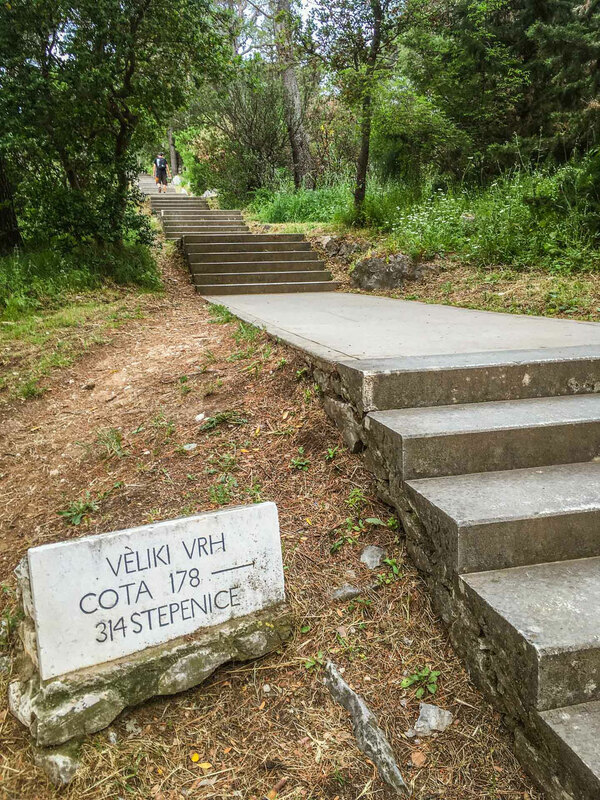 We began our day by walking through narrow, cobblestoned, atmospheric side streets on our way to the Vidilica Cafe, which is immediately outside the park entrance. 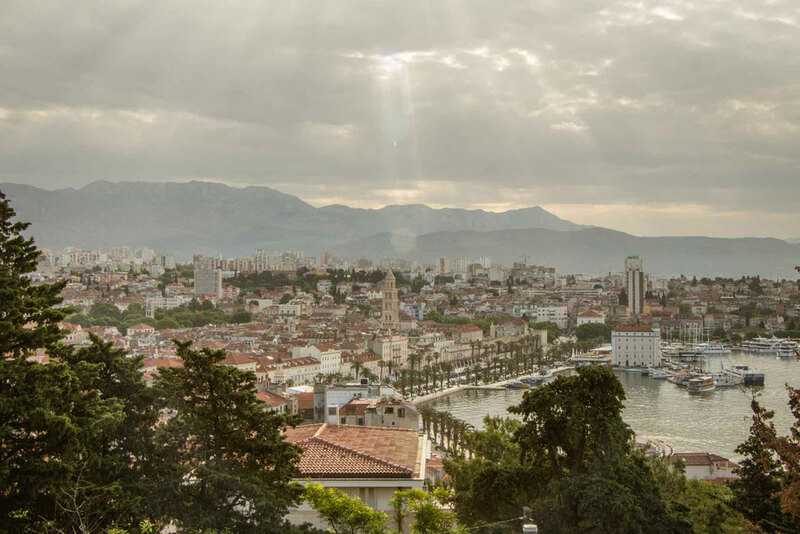 The last stretch of the walk to the cafe is up a long flight of stairs, but it’s worth the effort for the amazing views of Split below. We spent a few hours walking through the park, enjoying the relaxing feeling of being in such a beautiful, natural space with towering pine trees and birds chirping. We completely forgot about the hordes of tourists we left behind in town. 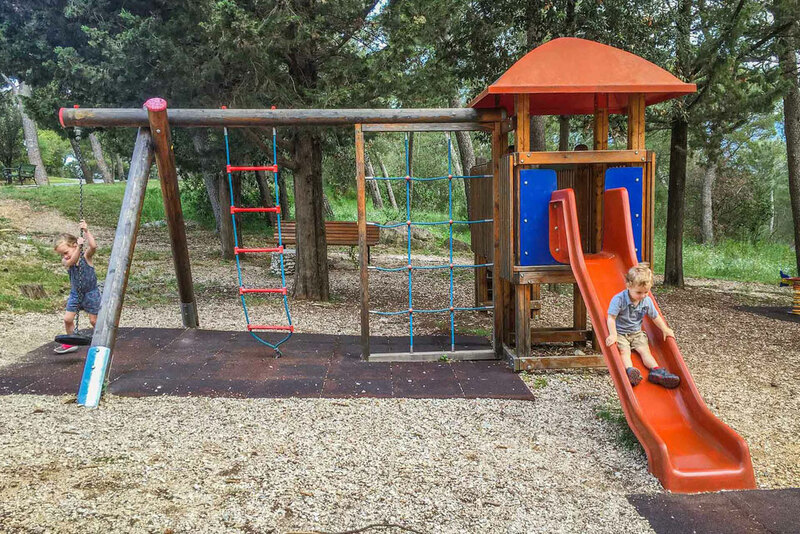 We stopped for a while at a playground and at the summit of the hill (where a huge Croatian flag flies) to enjoy panoramic 360 degree views of the whole area. 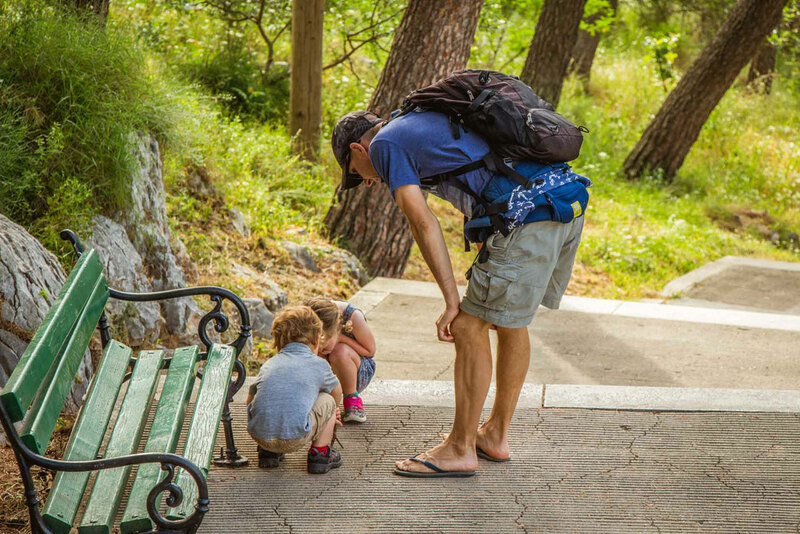 The paths within the park range from paved to full-on hiking trails, so choose your footwear properly. We didn’t… we wore flip-flops and regretted it as we walked a few kilometers over rocky hiking trails on our way from the summit to the beach. Along the way we were lucky to have passed the little hermitage which was built into the cliffs on the south side of the peninsula. Marjan Park is huge and is hard to find your way around. There are no maps and very little signage. 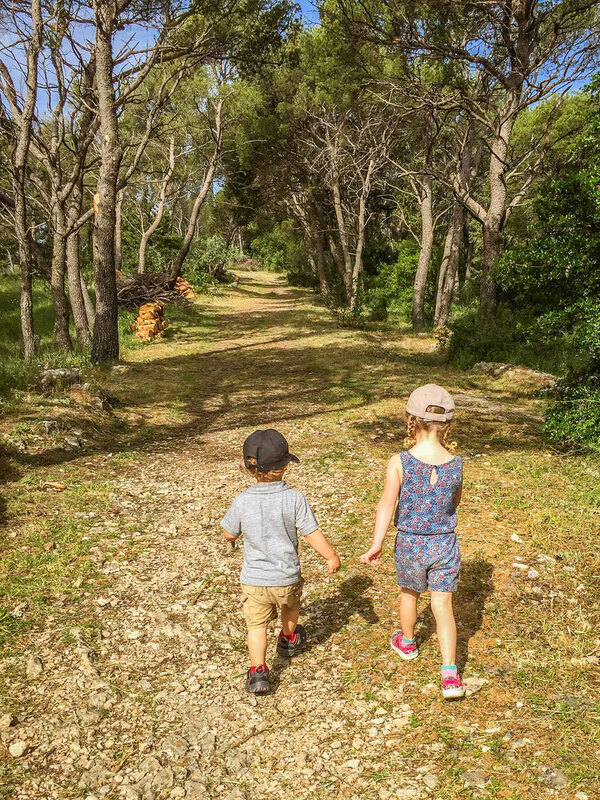 We managed to find our way through the park and to the beach by using our favorite hiking app, which had all the trails laid out for us to follow. Kasjuni Beach is beautiful and is worth the effort to get there. 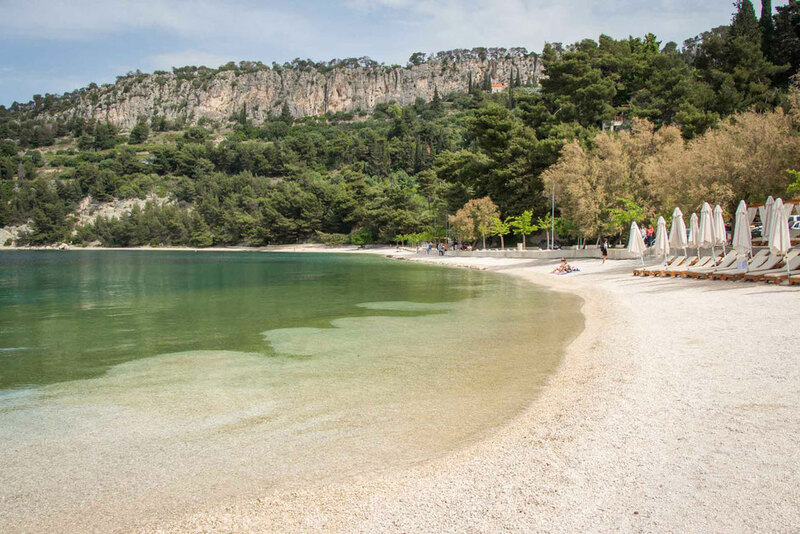 This beach is way nicer than the city beaches the day before; it’s in a protected cove with towering cliffs on one side and a palm tree lined peninsula on the other. The beach has small pebbles which weren’t too hard on the feet. The water was very calm and the kids had a great time playing in it. It was early May and the water was still pretty cool, but the kids didn’t care. 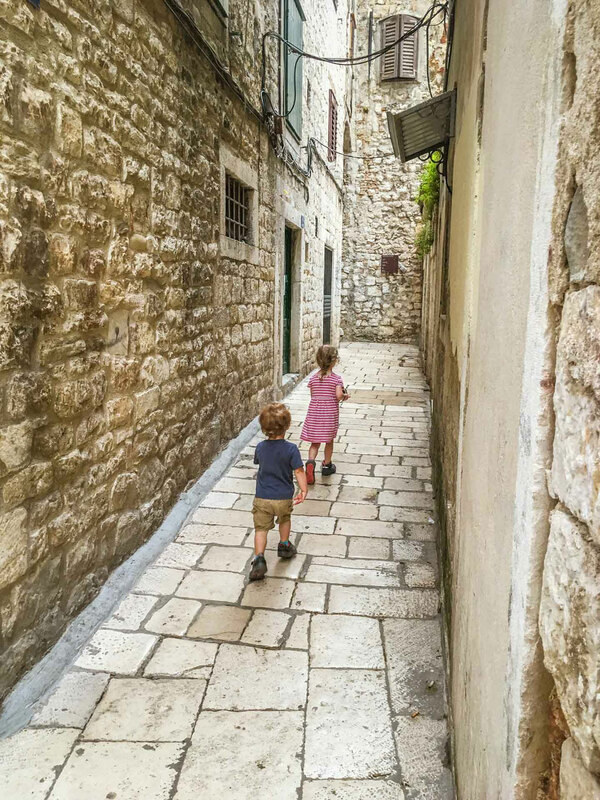 With an early morning ferry from Split to Hvar, where we planned to visit the beaches on Hvar with kids, we couldn’t pass up one last afternoon walking through the ancient alleyways and along the bustling Riva waterfront. 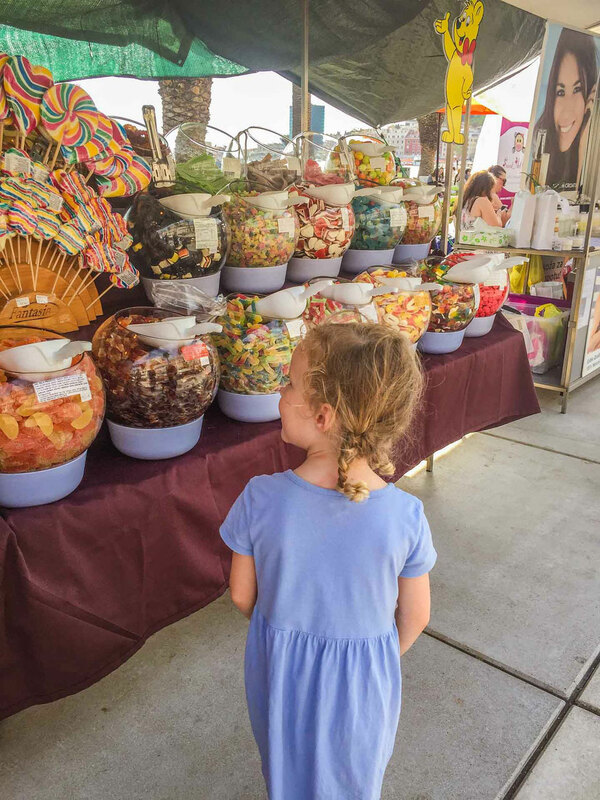 We were pleasantly surprised to see a market going on and the kids loved looking at everything at the booths. 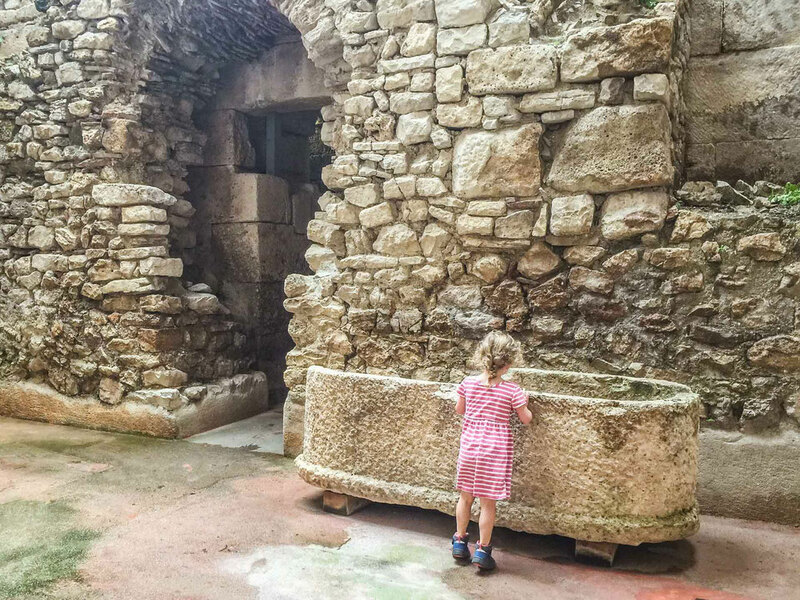 Finding things to do in the cities in Croatia with kids was super easy! 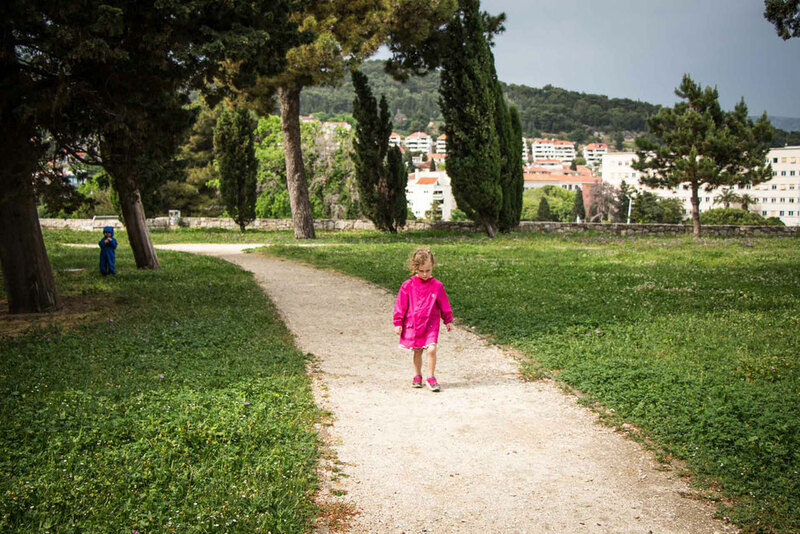 We had no trouble finding fun things do in Dubrovnik with kids and were pleasantly surprised with the day we spent in Zagreb with kids. 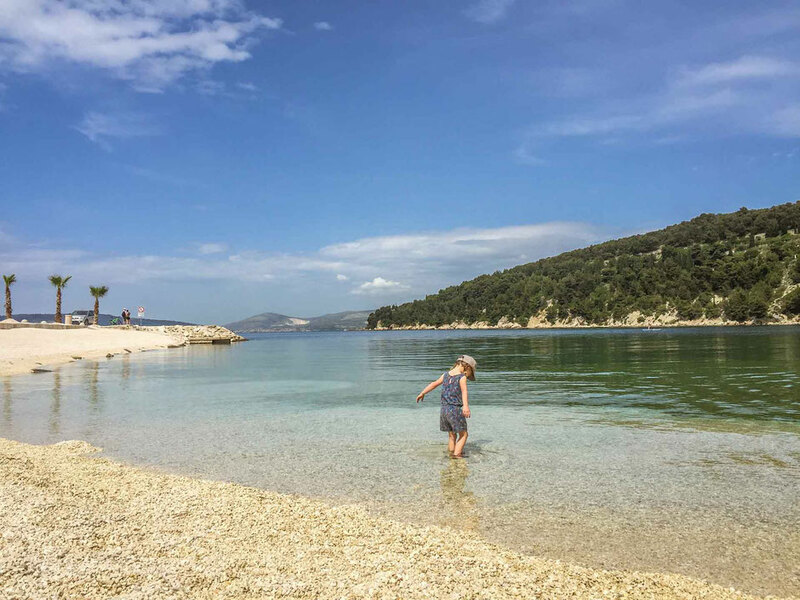 Great to see families travelling around with small children 🙂 Nice blog and photos!